I've finally figured out what is happening. For some reason Windows decides that This file came from another computer and might be blocked to help protect this computer. Until I figure out how to sign the file so windows doesn't do this anymore, the plugin needs to be 'Unblocked'. You can do this by opening the properties for the file, then clicking the 'Unblock' button that's near the bottom. That's odd. It sounds like we are back to the second from original issue. It shouldn't make a difference, but I would check to make sure that your anti-virus software is not blocking it. Just out of curiosity, what Version of windows are you running? hmm... That's the same OS we are running over here. Ok, What program are you using to create your Virtual Serial Ports/Serial bridges? I was using Eterlogic's VSPE and wasn't having any trouble, but let me try those. Another thing to look at when you have everything setup, does VirtualVP show activity on the port that Add-InWx is setup to use? Can you try setting up VVP to allow a TCP/IP, then configuring Add-InWx to connect via that? Sure, PM me with your email address. Or send me an email. EDIT: never mind. I just remembered that you have sen me emails before, so i do have youre email address. Version 1.0.1.1 Beta is now available for download! The Plugins Get put into your "Documents\Add-InWx\Plugins" Folder. I know its been awhile, But I'm back! I'm REALLY excited to show you this one! Here's a Screenshot Preview of the Wunderground Forecast plugin that I've been working on. It's not ready for download yet... but it will be soon. And its now available for Download! EDIT: By the way, you will need to get your own API Key from Wunderground to use this plugin. Along With it, Version 1.0.1.2 Beta is ready. Version 1.0.1.2 Beta Is back to targeting .NET 4.0, so for those who which to give it a try on XP it should run. > Window Size, Location and Style (FullScreen, Maximized, Windowed) information is now stored when Add-InWx is Closed. > Fixed Add-InWx not loading if a background Image was not selected. Head over to www.addinwx.net to access the download links. There is difference between the 2 Wunderground dll's. One is for Uploading while the other is for getting and displaying a Forecast. Oops.. I posted the wrong Link, again. Its fixed now. 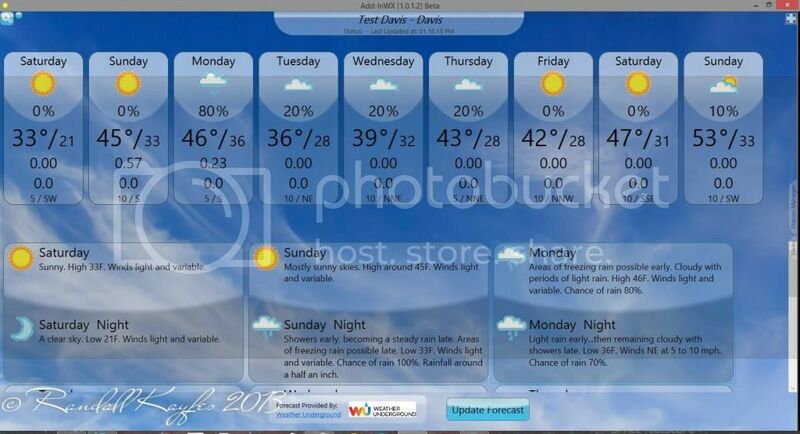 Since the Wunderground Forecast plugin uses the "10-day forecast summary", you will need to get the "Cumulus Plan". In the "How much will you use our service?" Section I would go with the "Developer" Option so its free, unless of course you want to pay $150 a month. Once you have one, Open the Options window in Add-InWx. Under the "Views" tab select the "Wunderground Forecast" item on the left. On the right there's an "API Key" Textbox, and that's where the "Wunderground API Key" gets entered (Or pasted if you do a 'Copy/Paste'). To view the forecast (Or any "View" Plugins for that matter) in Add-InWx there's 2 tabs located half-way down the right side of the main window. Clicking on the one titled "Views" will expand a list that you can select a View plugin to display. The second tab you don't need to worry about, it's not used for anything. No updates yet, just a few thoughts on Development. I haven't received any bug reports lately so out of curiosity, Has anyone had any issues of any kind? Also if you have any suggestions for something (even if its a change to something that's already in Add-InWx) please send them. At this stage in development your input can have a large impact on the program. By the way: If you would like me to send you an email when a new version is available, mention it in an email. I've been thinking about starting an OpenSource version of Add-InWx for Linux. If you have any thoughts, insights or suggestions feel free to share. I'm also thinking about bringing on other people to help with the project, for now they would be working for free (well, other than their name in the credits section). If you would like to help, let me know. Add-InWx Version 1.0.2.1 is now available for download. I've also made a few changes to addinwx.net. The contents of the Change logs are now a portion of the text on the Download Links page, and all the .zip files for the different versions of Add-inWx are now stored on the webserver instead of my Box.com account. The plugins however are still located in my box account, but they will probably be moved later this week or when I update them. I am trying to figure out how to install this program and upgrade. Kinda confusing. Right now I'm distributing Add-InWx as a "Stand Alone" program, Meaning that there is no Setup/Install file to run. If you have done that already and it still doesn't work, your antivirus might be blocking it. I have already done that. I can get 1.0.1.1 running. I have tried 1.0.1.2 and 1.0.2.1 they do not start up. I'm Looking at the change logs and just had an "Aha" moment. Units types are now set once for the entire program instead of individually for each view. This I do remember having an effect on the config files. So I bet if you empty your "Documents\Add-InWx" folder the new versions will startup. Edit: Also make sure to have the latest versions of the whichever plugins your using, because that change required me to update those as well.